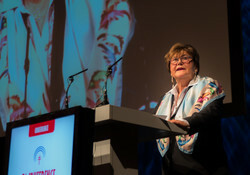 Dr Zsuzsanna Jakab addresses the 7th Conference of the International Union Against Tuberculosis and Lung Disease during an official visit to Slovakia on 21–23 June 2016.
to address participants at the 7th Europe Region Conference of the International Union Against Tuberculosis and Lung Disease (The Union). Minister Drucker explained that his priorities are to increase the effectiveness of the Slovak health system, strengthen the role and impact of primary health care, build comprehensive, integrated health care delivery with a patient-centred approach, and reduce the high level of medicine consumption. Other concerns include tackling increasing antibiotic resistance and lower vaccination rates. drug shortages in the European Union. Dr Jakab congratulated Minister Drucker on the recent positive developments in health in Slovakia and assured him that WHO Europe will continue to assist the country not only through collaborative agreements but also in regards to the priorities selected for the EU Presidency. Dr Jakab emphasized that improved health outcomes, especially keeping people healthy during the whole life-course, cannot be achieved by the Ministry of Health alone. Whole-of-society and whole-of-government approaches to tackle health determinants and risk factors are essential, and for this reason WHO has put together a suite of best practices. The Regional Director also highlighted Slovakia's excellent work in combatting TB and moving toward TB elimination, pointing out that it was appropriate that the 7th Europe Region Conference of The Union was held in the country. Dr Tomas Drucker thanked Dr Jakab for WHO's continuous support through the Country and Regional Offices, and in particular for the support offered during Slovakia's EU Presidency. The Minister invited Dr Jakab to attend the Informal Meeting of Health Ministers, set to take place in Bratislava on 3–4 October 2016. On 22 June 2016, Dr Zsuzsanna Jakab opened the 7th Europe Region Conference of The Union with Mr Andrej Kiska, President of Slovakia, and Dr E Jane Carter, President of The Union. Over 600 experts from the WHO European Region and beyond attended to discuss the latest scientific findings and to exchange experiences on the prevention and control of TB and lung diseases. During her opening speech, Dr Jakab highlighted the need to work hand-in-hand with all sectors to improve health in line with the Health 2020 European policy framework and in the 2030 Agenda for Sustainable Development's spirit of leaving no one behind. The joint meeting of the WHO/Europe National TB Programme Managers and the EU/EEA TB Surveillance Network focal points preceded the Conference. During a meeting with the Health Committee of the National Council of the Slovak Republic, Head of the Committee Dr Stefan Zelnik expressed his appreciation for WHO's work to set standards for better health protection and health care, address global health threats and emergencies, and lobby for better health globally. Dr Jakab had a fruitful meeting with Mr Jaroslav Chlebo, Director of the UN and International Organisations of the Ministry of Foreign and European Affairs of the Slovak Republic. Discussions covered goals and commitments to the 2030 Agenda for Sustainable Development. During her visit, the Regional Director also met Mr Andrej Kiska, President of the Slovak Republic. One of the President's priorities has been to reduce the health divide in the country. Here he referred to the Roma minority whose health conditions have lagged behind the rest of the population for decades in spite of many interventions to address the situation. Dr Jakab confirmed that working with marginalized populations is a challenge in many countries, but pointed out that there are good tools that Slovakia could use, for example health mediators working directly in the communities. Dr Jakab also referred to the Sustainable Development Goals, adding that "Goal 3 on health and well-being, together with its indicators, paves the way to achieving improvements in health, but there are many targets in other goals that further contribute to health." WHO/Europe is ready to help Slovakia in all areas of its mandate. On the occasion of her official visit to Slovakia, Dr Jakab was awarded the Gold Medal of St. Elizabeth University of Health and Social Science for her contribution to combating communicable diseases in the European Region. The award was handed over by the founder of the University, Professor Vladimir Krcmery, at a ceremony attended by members of the University, students, representatives of the Ministry of Health and invited guests. In her thank-you speech, Dr Jakab stressed the need for continuous vigilance in the face of the threat of communicable diseases that spread beyond borders. Dr Jakab underlined the need to retain high vaccination rates for vaccine-preventable diseases, with a special focus on eliminating measles and rubella.